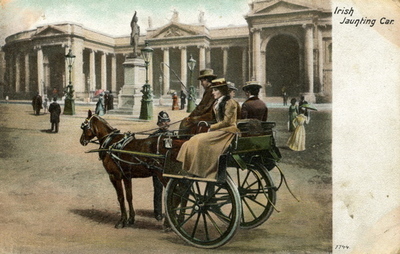 a light, horse-drawn, two-wheeled open vehicle with seats placed lengthwise, either face to face or back to back . . . . Also called an outside car or sidecar, it was peculiar in that its seats ran longitudinally and the passengers' feet were placed on a footboard outboard of the wheels. Legend tells of the knights of Erin fighting battles in chariots arranged this way.